An effortless look for a breezy day. Today I decided to style out my sleeveless jacket adding a little edge with my white ripped jeans; the contrasting colours work well, allowing a more summer vibe and a brighter ambience with a minimalistic take (as you pretty much can tell, I’m all for the simple pieces). The ripped detailing adds more Chic to the outfit; balancing the sophistication of the structured jacket with the casual and relaxed look of the denim jeans. On another note, I am currently OBSESSED with these new white jeans! I was always put off buying a pair because I thought they were extremely high maintenance to maintain its whiteness, but these have changed my life (maybe a little exaggerated, but try a pair on and you’ll know the feeling!) I have been scouting for a pair like these for a while and I am glad that I’ve finally got them! Because I have plenty of white tops, I always paired them with darker bottoms however, these are some serious game changer! – A must have in your wardrobe! Hope you guys enjoyed this look, let me know what are the key pieces in your wardrobe! This is one of my favourtie looks of your hun! Love the khaki vest with the white, funny as I have a white vest and styled it with black and khaki 🙂 I've always wanted white jeans but I'll stick to my light grey ones as i know I can't keep white jeans clean! Aww thanks Hanh! 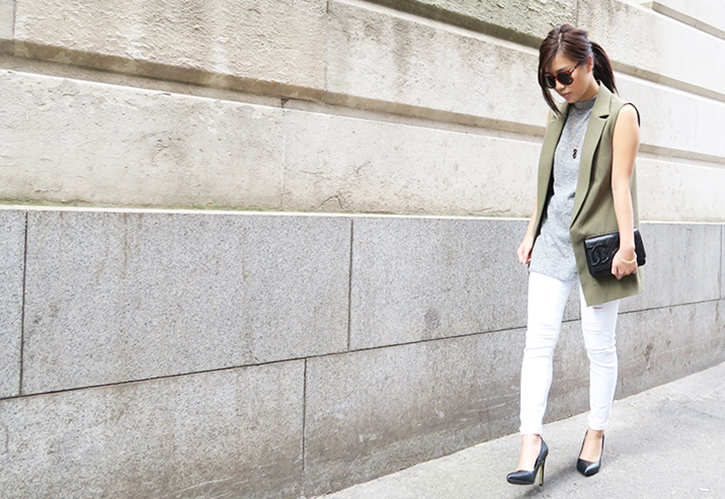 Invest in a pair of white jeans, you won't regret it :)…these are my first pair and I don't plan to stop haha!